"Mum, what’s that smell?" Boomerang asked, sniffing the air. The other animals, squished in Wandi’s pouch with the joey, began sniffing too. "I smell it! There must be a fire. It’s smoke!" Banjori said. Wandi stopped hopping. "It is a fire. Look over there," she said, pointing to billowing smoke. "The bush is on fire. Oh no! We’d better get out of here. Bushfires spread quickly," Daku said. "Mum, hop to the nearest billabong. I don’t want to get burned," Boomerang cried. The sounds of the grass burning frightened the animals. "When the fire hits those eucalyptus trees, we’re going to hear some explosions. I know the leaves are filled with eucalyptus oil. It burns hot and it burns fast," Jiba warned. "You’d better listen to Boomerang and get to the billabong as fast as you can." Wandi looked at the orange flames. She could hear the popping and crackling of trees as the flames engulfed them. "They say when it’s a windy day and there’s a fire in the bush, it’s a very dangerous thing," Tinka added. "Think of all the other animals caught in it. I hope they are able to escape." When they arrived at the billabong, they were surprised to see hundreds of other bush animals crowded around and standing in the water. Smoke was thick in the air and hot embers, carried by the wind, were landing in the surrounding grasses. Huge, hot clouds formed above the fire. "I’m frightened, Mum," the joey cowered. 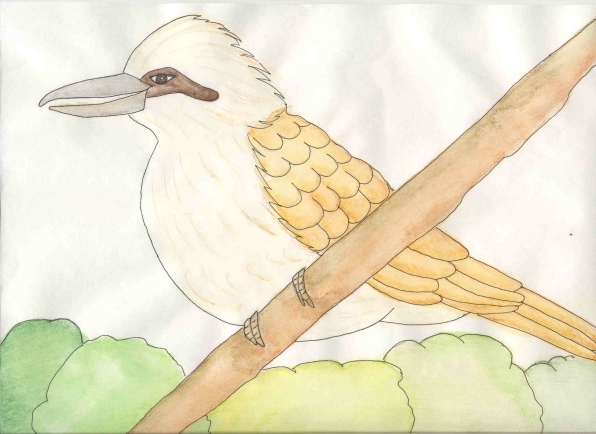 "Everybody get out of my pouch and go into the billabong," Wandi shouted, seeing the flames moving closer and closer. "Hurry!" The koala, wombat, echidna, skink, kookaburra, platypus, spider and two kangaroos squeezed into the crowded pool of water. "What if there’s a croc in here?" Kiah worried. "That’s the least of our worries," Yindi said. "Look who’s over there." She pointed to the other side of the billabong. "Oh no! It’s Boomer and Old Man!" Nimu sighed. "They’ve not seen us yet, so don’t worry. There’s too much smoke. They’re more worried about saving their own hides than about us," Wandi said, calmly. For hours the fire raged around them. Cries of fear filled the air as the smoke grew thicker and thicker. Luckily, as night fell, the winds died down and the fire ran out of fuel around the billabong. "Everything’s so black now," Jiba said. "Look at the trees. There is nothing left but charcoal stumps." "The ground’s burnt too," Daku noted. All night the animals stayed in the water. When the sun rose in the morning the first animal crawled out onto the blackened ground. "It’s not hot anymore," the dingo shouted. "You can all come out." Wandi and the others walked out of the water. "I want to go home, Mum," Boomerang sobbed. "I don’t like it here anymore. I want to find our baobab forest." "Now, now, Boomerang. We’ll get home soon. Don’t cry," Wandi said, patting the joey’s head. "Well, well, well. If it isn’t our friends," Boomer said, hopping towards the group. "Look what the fire brought to us." Old Man hopped along beside him. "The flyer! You’ve got a powerful kick there," Old Man said. "Where are you going to hide this time? There are no trees and there’s no croc to protect you," Boomer snarled. "Everyone inside the pouch," Wandi ordered. They quickly climbed inside her pocket. "Oh no you don’t. You’re not getting away that fast," Old Man said. He was standing on Wandi’s tail so she couldn’t hop. Just then a burnt branch fell from the only remaining tree. It landed on the ground right next to the two kangaroos. Boomer jumped and Old Man fell over with a fright. Seeing a chance to escape, Wandi hopped away as fast as she could. The ground was hot in parts but she kept on hopping. The others looked at the destruction done by the bushfire as they hurried away. "Mum, hop fast. Don’t let them catch us!" Boomerang yelled. Wandi wasn’t sure which direction she should go. There were no trees or landmarks. All she could see was a huge red rock off in the distance. "Is that Ayer’s Rock?" Tinka asked. "It looks like it," Wandi said. "I’ll head for it. We can climb to the top and have a better view. I’ve no idea where else to go." Soon they found themselves standing at the bottom of the giant rock mountain. "It’s much bigger than I thought. I can’t hop to the top with you all inside. You’ll have to get out and climb it yourselves." After listening to the others moaning and grumbling about it, Banjori started to climb. "This is much to steep for a koala," he found himself complaining. "How can that be?" the wombat asked. "Koala’s climb trees every day." "Yes, but this is different. It’s like having a hundred trees on top of each other," Banjori answered. "I suggest you just keep moving," Daku replied. "I’m a wombat and I never climb, but if Boomer and Old Man come, we’ll wish we’d gone up faster." "You’re right," Banjori said and made his way up the rock. 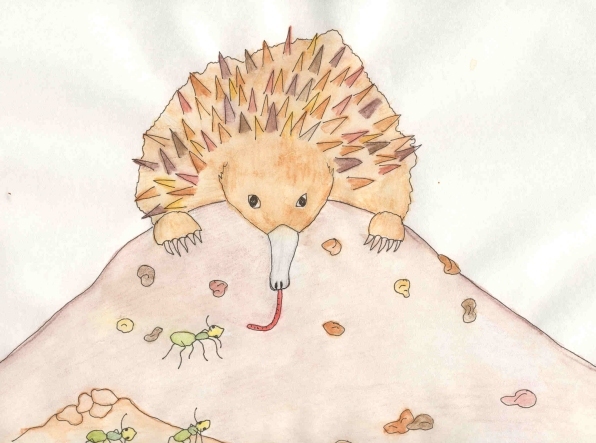 The echidna couldn’t roll up the mountain. She had to use her feet. "I’m sure it will be much more fun coming down," Jiba said. Her spikes were dark and dirty with smoke, much like the other animal’s fur and skin. "I’m only a small lizard. I have to take ten steps for every one of yours," Tinka said, but kept climbing. "This is one time I’m glad I have wings," Yindi laughed. "I can fly most of the way." "Can I sit on your back? Will you give me a ride?" the trap door spider asked. "I’d have to take one thousand steps for every one of Banjori’s." "Hop on, Nimu," Yindi said. The spider climbed onto her feathered back and grabbed hold. Wandi saw that Kiah was having a hard time climbing. 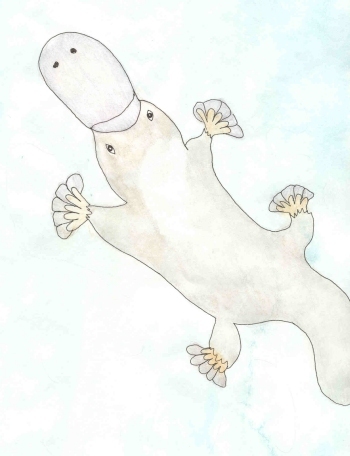 Platypuses have webbed feet and can’t walk well on the ground. They do much better in the water. "Get in my pouch with Boomerang," Wandi said. "This is much to difficult a climb for you." Kiah was grateful and joined the joey in the pouch. The others weren’t too happy with that but kept going. After a few hours they reached the top. "Whew! That was a hard climb," the koala said. He was huffing and puffing. The rest of them collapsed on the stone next to him. "Wow! What a view!" Yindi laughed. "You can see all of Australia from here!" "Not quite," Wandi smiled, "but we can see if Boomer and Old Man come anywhere near us." Everywhere they looked, they could see parched ground. The fire had destroyed all the trees, grasses, and shrubs for miles. "That’s sad to see," Boomerang sighed. He was feeling bad about the trees being burned. "It’s not all bad," his mum explained. "Now new, fresh grasses will grow and it will soon be green again. Don’t feel too sad." The sun went down, changing the blue sky into deep pink, purple, orange, and red. "Now what?" Kiah asked. "Sleep. We’ll deal with it in the morning," Wandi said. As the sky became dark and stars appeared, the animals fell asleep, not knowing what tomorrow would bring.